Although overall eelgrass abundance appears to be stable in Puget Sound, some local areas are showing declines. A 2014 report from the Washington State Department of Natural Resources looks at the potential impact of increased nitrogen on eelgrass health. Eelgrass in Dumas Bay, Central Puget Sound 2013. Photo courtesy of DNR. Eelgrass is a critical component of the Puget Sound ecosystem, creating habitat for juvenile salmon, Dungeness crabs and numerous other species as well as stabilizing the seafloor, filtering near shore waters and contributing to the food web. Recognizing the importance of eelgrass to Puget Sound, the Puget Sound Partnership established eelgrass as a “Vital Sign” for assessing the status and health of the Sound and identified eelgrass as a primary indicator of ecosystem recovery. Although DNR’s long-term eelgrass monitoring in Puget Sound shows no detectable change in Sound-wide eelgrass area between 2000 and 2012, eelgrass in some parts of the Sound is experiencing stress and showing localized declines. 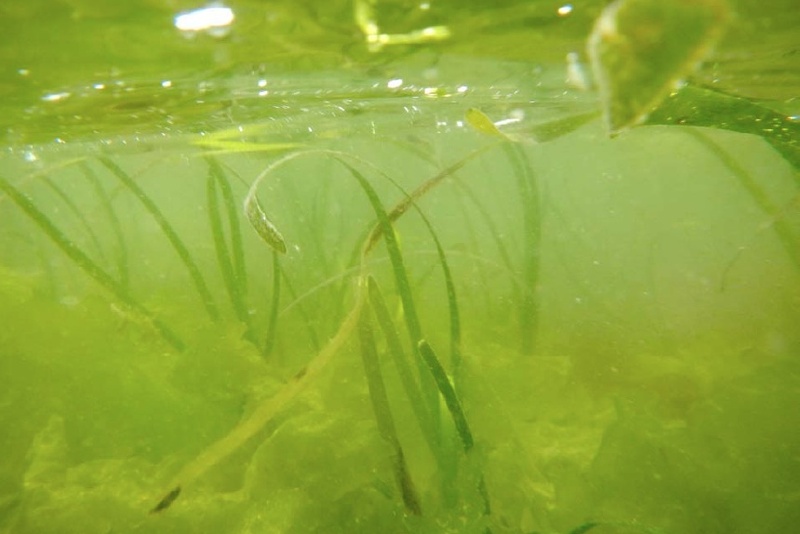 The focus of this document is to consider nitrogen as a stressor to eelgrass in Puget Sound, so that managers can prioritize and address this potential problem as it impacts eelgrass health. The intent of the paper is to elevate nitrogen within the discussion of more universally understood stressors within Puget Sound. Failure to incorporate nitrogen reduction strategies into a comprehensive recovery strategy could undermine efforts to meet the 2020 recovery target. Without such actions, the Puget Sound Partnership goal of a 20% increase in eelgrass distribution by 2020 will not be met. The Partnership’s effort to recover previously lost eelgrass areas and habitat functions is an important step to regaining the full health of the Sound and maintaining its long-term sustainability and productivity. Increasing nitrogen concentrations, measured as nitrate by the Department of Ecology, have been seen throughout the Sound over the past 12 years and much of this is believed to derive from human sources. Nitrate levels are increasing more rapidly within the Sound than in the Strait of Juan de Fuca, indicating sources of nitrogen from the watershed. In several locations in South Puget Sound and Hood Canal, eelgrass has been observed growing with typical symptoms of nitrogen over-enrichment including loss of plants at the deep edge of the bed, nuisance seaweed overgrowth, and heavy epiphyte loads. It is well known that nitrogen is an indirect stressor that promotes phytoplankton blooms in the water column, thereby decreasing the amount of light reaching eelgrass growing on the seafloor. Eelgrass requires relatively high levels of underwater light for photosynthesis and growth. Elevated nitrogen also promotes the growth of nuisance seaweeds that shade and smother eelgrass, and of epiphytes, which attach to the leaves of the plants. In the spring when eelgrass is growing fastest, phytoplankton blooms can extend over much of Puget Sound, attenuating the light reaching the eelgrass. On a worldwide basis, nitrogen and sediment loading are considered the two main stressors to eelgrass and other species of seagrass. Efforts to reduce Sound-wide nitrogen loading need to be incorporated into a comprehensive recovery strategy in order to maintain and expand the crucial Soundwide eelgrass resource. In other places around the country, targeted management has focused on nitrogen point sources initially because ameliorative technology is readily available; non-point sources are also a major factor that can be addressed simultaneously, but they are more diffuse and intractable. Other estuaries nationwide have ignored the early-warning eelgrass indicator and the degrading impact of nitrogen to eelgrass and spent many millions of dollars to recover eelgrass habitat and estuarine health once they have been lost. What is good for eelgrass is good for Puget Sound. Short FT. 2014. Nitrogen as an Eelgrass Stressor in Puget Sound, 2014, Aquatic Resources Division, Washington State Department of Natural Resources, Olympia, WA. 37p.